After the patient completed antibiotic therapy for ecthyma gangrenosum, the characteristic eschar remained a while longer. Chronic high-dosage steroid therapy can pose a significant risk factor for infection due to its immunosuppressive effect. A 70-year-old African American man presented with acute bilateral painless vision loss. An investigative work-up produced a positive antinuclear antibody titer of 1:1280 with a speckled pattern, a positive test for anti-Ro/anti-Sjögren’s-syndrome-related antigen A antibody, and an erythrocyte sedimentation rate of 125 mm/h. The findings led to a diagnosis of bilateral retinal vasculitis, for which the patient was prescribed prednisone, 80 mg daily, for 1 month, followed by prednisone, 60 mg daily. His vision improved with steroid therapy. Three weeks later, while on the lower prednisone dosage, he was evaluated for a rash over his right knee. He noticed it after waking up and was examined a few hours later. He did not recall any local trauma or falls. His medical history included an allergy to penicillin. A well-demarcated 2-cm area of nonblanching erythema was situated just above the patient’s knee. No pus was expressed. Clindamycin was prescribed empirically. Twenty-four hours later, he had local pain and dark discoloration at the center of the erythema. On examination, he had an intense darkened area of skin surrounded by reddening. He had no fever. His serum white blood cell count was 13,100 cells/cm3, and his erythrocyte sedimentation rate was 7 mm/h. Clear fluid was expressed from the center of the darkened skin area (Figure 1), and a sample was sent for microbiologic culture. No polymorphonuclear cells or organisms were present on a Gram stain. Blood cultures did not show any bacterial growth. Within 24 hours, the culture of the aspirated fluid was positive for Gram-negative rods, and the final culture result showed these to be Pseudomonas aeruginosa. The organism was susceptible to cefepime, aztreonam, and ciprofloxacin. Patients can have the distinctive ecthyma gangrenosum lesions without concurrent fever or other symptoms of sepsis.5, 6 In a detailed analysis of 167 ecthyma gangrenosum cases described in the literature from 1975 to 2014, 123 (73.65%) were associated with P. aeruginosa infection.1 Other bacterial etiologies, including Escherichia coli, Staphylococcus aureus, Aeromonas hydrophila, and Mucor species, were detected in 29 cases (17.35%). Of the 123 patients with ecthyma gangrenosum due to infection with Pseudomonas species, 72 (58.5%) had sepsis. The remaining 51 patients (41.5%) had no septicemia (or bacteremia). Our patient had been treated for retinal vasculitis with high-dosage prednisone therapy for a prolonged time. Despite his relatively immunocompromised state, he did not present with septicemia or bacteremia, and he did not improve with empiric coverage for Gram-positive cellulitis. 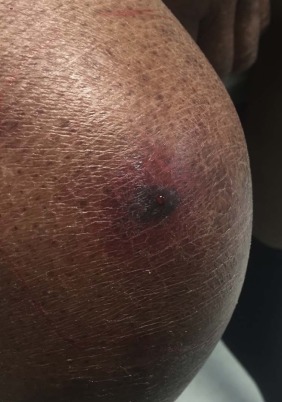 Skin necrosis, even in the absence of systemic symptoms, should lead to heightened suspicion for ecthyma gangrenosum, as well as for noninfectious etiologies, like skin necrosis associated with warfarin therapy, Sweet syndrome, cutaneous vasculitis, and pyoderma gangrenosum.